We are learning all about dinosaurs this week and so we made some dinosaur fossils. 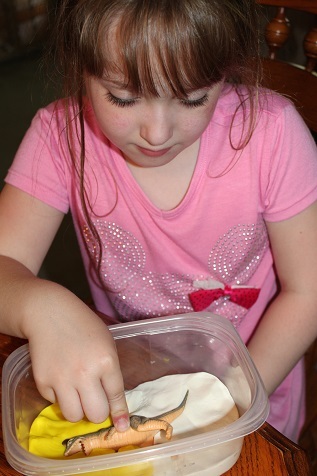 First we put some playdough into a plastic container and pressed a dinosaur into the playdough. 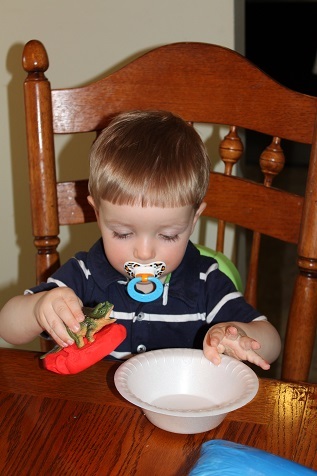 Take the dinosaur out and see the indentation that it leaves in the playdough. Hunter had great time making footprints with his dinosaur. This picture didn’t come out, but it’s the only one I have of this step. 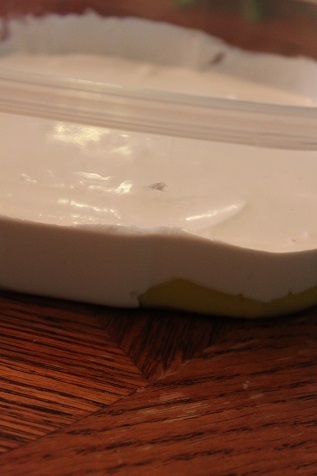 Next mix up some Plaster of Paris (use a 2:1 ratio with water). 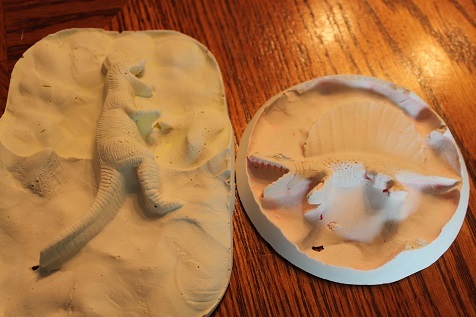 Pour the plaster over your playdough so that it fills in the indentation left from the dinosaur. We let ours dry for a couple of hours. 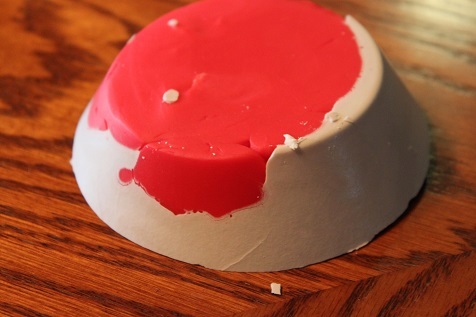 After the plaster was dry, I popped Hunter’s out of his styrofoam bowl. Then, peel off the playdough. This part ended up being kind of difficult. 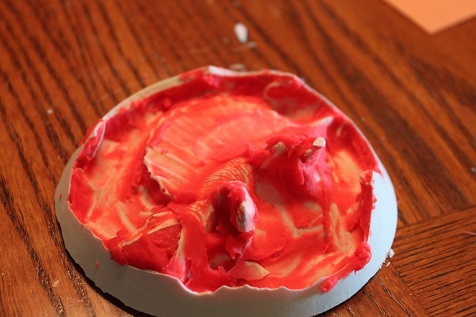 I would recommend using older playdough if you have it. Ours was new and still pretty sticky. I ended up scrubbing it off with water and a toothbrush. 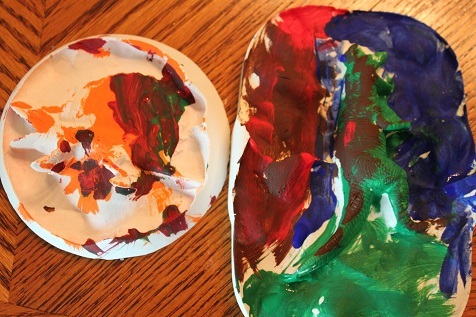 Or use white playdough if you have it, that is what Hailey used for half of hers and we couldn’t see what was left behind like we could with the red. 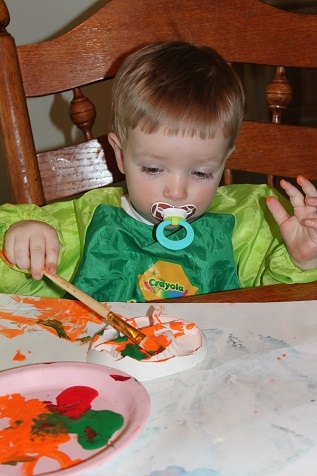 Hunter works so carefully when he paints. 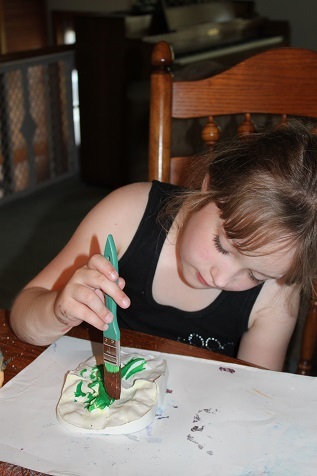 Hailey working on her painting.